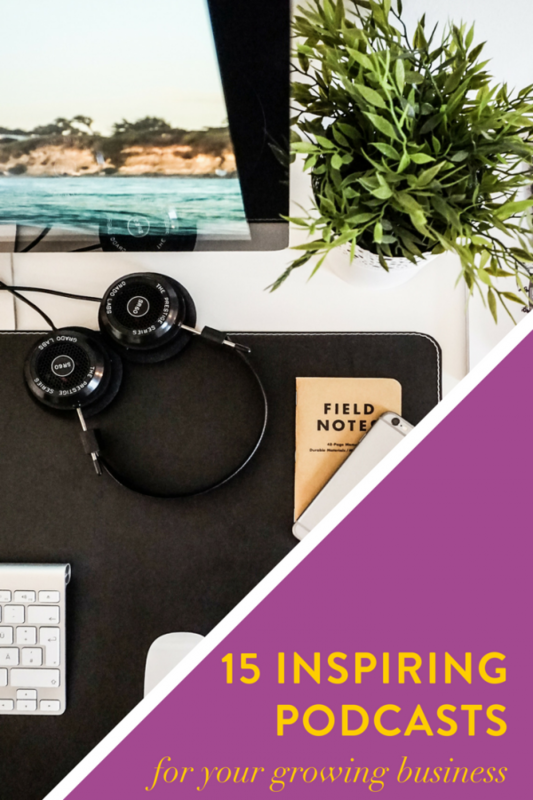 Whether your interests lean toward business tips, creative inspiration or pure entertainment, podcasts are fast becoming many people’s favorite forms of taking in new information. I am personally a huge fan of podcasts, because I love listening to shows while I’m taking an afternoon walk, lifting weights at the gym or doing chores around the house. Our agency has also increasingly transitioned to pitching podcasts. Whereas 2-3 years ago, we primarily worked with media outlets like Fast Company, Entrepreneur and Inc, today we’re focused almost exclusively on podcast outreach. This is because podcasters have discovered something important — when someone spends 45 minutes to an hour listening to you share your passion and expertise, they tend to become big supporters of your work! Tracking results for our clients, we’ve found that podcasts are outperforming other media types by large margins. I’ve been educating our clients behind-the-scenes on this amazing opportunity, and today I thought I’d come up for air and share some of the shows we’ve been working with — and listening to! — lately. I wish I could remember exactly how my team stumbled on Don’t Keep Your Day Job, as it’s fast become one of my go-to podcasts for inspiration on doing creative work. Host Cathy Heller has a unique background, which helps her podcast stand out in this crowded field. She’s a leader in music licensing and has been featured in Billboard, LA Weekly, and Variety for having licensed her songs hundreds of times to film, TV and ads. Cathy went on to start her own licensing company, Catch the Moon Music, where she now pitches other artists. Check out her interview with Christina Scalera on how to build your creative empire. Speaking of which, Christina actually became our client after I pitched some clients to guest on her podcast! If you’re a creative entrepreneur, odds are you already tune into Creative Empire, which Christina co-hosts with Reina Pomeroy. If you don’t, this interview on mindfulness and self-compassion with former client Dr. Leah Weiss of the Stanford Business School is a good place to start! Every so often, I get a question from someone who knows I worked as marketing director for CoCommercial and wants to know why Tara Gentile switched gears with her business model. She recently appeared on the excellent podcast Creative Warriors to talk through just that! If you’ve been thinking about pursuing a membership model for your business, this interview between Tara and Jeffrey Shaw offers an excellent behind-the-scenes look at what happened when Tara decided to pivot. If you’re a maker, this podcast is all about you! Kelly and Caroline specifically target product-based business owners through their upbeat, frank and helpful show. They recently released this interview with our client Megan Auman on how she uses Pinterest to grow online retail sales for her jewelry business. Spoiler alert: Pinterest is not a social media platform. It’s a search engine that thinks in images. While we’re on the topic of Pinterest, I also want to introduce you to Hashtag Authentic, who interviewed Megan on how to use Pinterest to make your work go viral earlier this year. I was initially introduced to this show, and its host Sara Tasker, by a team member, and I’ve since become a big fan. Just about every ideapreneur I know wants to become a paid public speaker, which is why I was thrilled when speaking coach Dr. Michelle Mazur launched her own podcast for speakers, entrepreneurs, leaders, and change agents who love speaking both onstage and off, and yet don’t have 100% confidence that they are nailing their message and making the impact they want to make on the world. One thing that can unconsciously hold you back from sharing your voice and ideas freely is the worry that someone will rip off your work. Can you protect your intellectual property if you share it broadly in a speech. Christina Scalera tackled this topic on Michelle’s show. Switching gears a little, Your Creative Push is a podcast that focuses on the creative process itself. This is not a show about how you can grow a creative business — the focus is on how you can finally pursue their creative passion, put aside their fears and excuses and start doing work. Host Youngman Brown is particularly sensitive to the fact that a lot of his audience has day jobs. Of course, I’m partial to his interview with book coach Jennie Nash on the importance of knowing why you want to do something creative like writing a book so that you can get through all of the resistances that you encounter along your journey. It takes conscious, constant and creative effort to make a life worth living. The One You Feed is a podcast that looks at how people keep themselves moving in the right direction – how they feed their good wolf. In this interview with Leah Weiss, hosts Eric Zimmer and Chris Forbes dove into how you can elevate your experience at work. If you want even more of a deep dive into writing tools, check out the Creative Writer’s Toolbelt interview with Jennie Nash. She joined this writing focused podcast to talk about figuring out what your book is really about. Side Hustle School is a totally unique podcast from Chris Guillebeau. Instead of sharing live interviews with business owners, Chris digs into a specific side hustle and produces a solo episode that takes you through their journey. The episodes are also shorter than many of the others on this list — typically around 10 minutes, because the show is released daily! Chris recently shared the story of how Kathleen Shannon and Emily Thompson transformed their skype “business bestie” calls into a 6-figure podcast. I would be absolutely remiss if I didn’t also share Being Boss on this list! Emily Thompson and Kathleen Shannon believe in building a business you love, making bank, and being unapologetically who you are 100% of the time. They have a combined experience and expertise in branding and coaching small online businesses to be more boss in work and life by focusing on “boss” mindsets, habits & routines, tools, tactics & strategies, blended with a little bit of hustle. Here’s Leah talking about bringing mindfulness into your work with Emily and Kathleen. I’ve been working with Charlie for years, and once upon a time, he interviewed me for Productive Flourishing. I absolutely love Charlie’s interview style, which is incredibly thoughtful and often disarming. His interview with Christina Scalera on both sides of being your own boss is one of my favorites. Carrie Green, founder of the Female Entrepreneur Association, is another business owner I’ve collaborated with a few times. She launched a podcast last year that extends the video content she’s long been producing for the FEA site. Megan joined her to talk about how she built a successful jewelry business. Hack the Entrepreneur is a podcast for entrepreneurs looking to develop their success mindset. From solo entrepreneurs to startup founders, digital nomads to Amazon FBA, Jon Naster digs into what it takes to be successful with building a SaaS company, affiliate marketing, passive income ideas, coaching and consulting, content marketing, and starting a small business. Check out this interview with Tara Gentile on community building, content marketing for customer acquisition, and her journey from freelancer to entrepreneur. The last podcast on this list is currently on a break, but I still wanted to include it, because I love Kristy! When I came across her show last year, I found it to be a breath of fresh air. She interviewed Leah Weiss, and they spoke about the sobering through that you will spend 90,000 hours of your life working— here’s how to make it count. Right after I hit publish, I realized I missed Profit.Power.Pursuit, the absolutely incredible podcast hosted by my dear friend and sometimes client, Tara Gentile. Which is a crime, because this is a totally unique show in that Tara asks clients detailed questions about how they run their business. If you’ve ever wondered how a business really brings in its revenue, or what’s working NOW, this podcast is for you. Start with the totally illuminating interview with Christina Scalera on how she’s created leveraged income with The Contract Shop. How and when to tell your story as a business owner? When I started my business 6 years ago, I often found myself selling my clients on the value of using more storytelling into their marketing. Thanks to venues like TED and the rise of narrative podcasts, the landscape has been shifting in favor of story. This is unequivocally a good thing — as stories are the universal language of connection. But as small business owners wholeheartedly embrace storytelling as a marketing tool, I’ve started to see the shadow side of story. When the story becomes all about you. Online, there is an epidemic of business owners introducing themselves not by sharing their work, or their credentials, but by sharing a rags-to-riches story. You can recognize these stories when, before you’re introduced to what the expert in front of you actually does, you’ve heard how far she’s come. This trend has become so prevalent that I’m seeing highly credentialed, talented business owners lead with a struggle story, instead of sharing the results they get for clients. Dr. Michelle Mazur is a speech coach and a master at effective storytelling. She’s long railed against the struggle story trend is speech-writing, and now that it’s followed her online in the form of Facebook ads, she’s raising the alarm. Michelle recently released a podcast on the question of whether telling your story is hurting your speaking cred. Michelle is joining me on Brigitte Rants About Marketing to talk about this problem more broadly. When you join us live for this live show, you can ask questions, participate in the live chat and leave feeling energized about ways you can achieve your goal of getting noticed online. We go live on Tuesday, June 20th, at 11 am Eastern, 8 am Pacific. Click here to save your spot.